June 17, 2015 – Determining the size of an Earth-size exoplanet by the amount of starlight it blocks hundreds of light-years away once was the realm of science fiction. Measuring the mass of such a small planet based on its gravity was another level entirely, but astronomers have done just that for an exoplanet fifty percent the size of Earth. Researchers using NASA’s Kepler mission data have measured the mass of a Mars-size exoplanet that is about one tenth the mass of Earth. 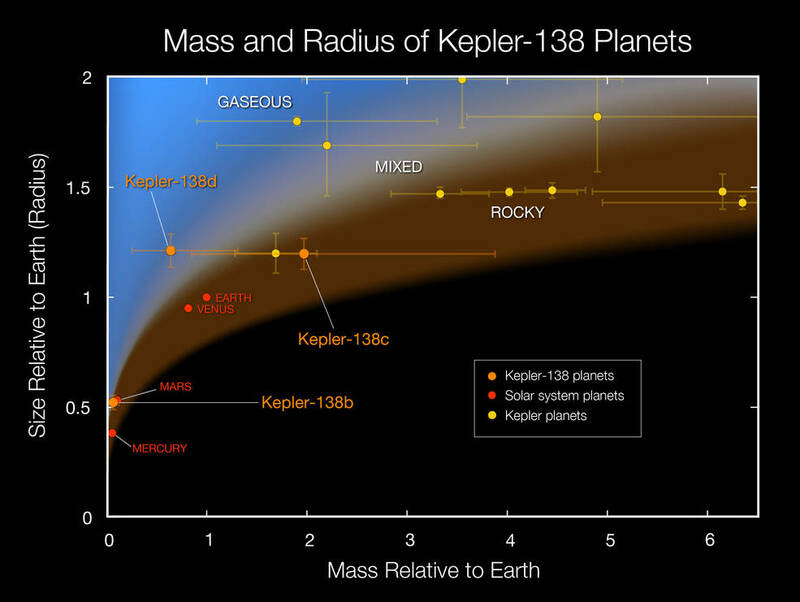 Called Kepler-138b, it is the first exoplanet smaller than Earth to have both its mass and size measured. This significantly extends the range of planets with measured densities. To determine a planet’s mass, astronomers typically measure the miniscule movement of the star caused by the gravitational tug of an orbiting planet. For planets the mass of Earth detecting such a tiny tug is extraordinarily challenging with current technology. Fortunately, when a star hosts multiple planets that orbit closely together, scientists have developed another way to get at the planets’ masses. Daniel Jontof-Hutter, a research associate at the Pennsylvania State University’s Center for Exoplanets and Habitable Worlds, led a team of astronomers in a study to measure the mass of all three planets by precisely observing the times each planet passed in front of, or transited, the star Kepler-138. “Each planet periodically slows down and accelerates ever so slightly from the gravity of its neighboring planets. The slight change in time between transits allows us to measure the masses of the planets,” said Jontof-Hutter. Each time a planet transits a star it blocks a small fraction of the star’s light, allowing astronomers to measure the size of the planet. This is how the Kepler spacecraft has detected thousands of planets around other stars. By measuring both the mass and size of an exoplanet, scientists can calculate the density and infer the bulk composition to determine if a planet is predominantly made of rock, water or gas. Tiny Kepler-138b’s density is consistent with a rocky composition like Earth or Mars, but further observations are needed before astronomers can definitively say that it is a rocky world. Kepler-138b is the innermost of three planets that orbit Kepler-138, a star less than half the size of our sun and roughly 30 percent cooler. The Kepler-138 system is located about 200 light-years from Earth in the direction of the constellation Lyra. The outer two planets, Kepler-138c and Kepler-138d, are approximately the size of Earth. Kepler-138c is likely to be rocky, whereas Kepler-138d is less dense and cannot be made of the same mix of material as Earth. All three planets orbit too close to their star for liquid water to exist on the surface and support life, as we know it. Much like astronomers in the early 20th century studied a wide variety of stars to characterize and classify different types, astronomers in the 21st century are doing the same to understand the diversity and demographics of planet populations in our Milky Way galaxy. Scientists are working to use these new measurements of small planets from Kepler and NASA’s upcoming Transiting Exoplanet Survey Satellite to identify patterns in the relationship between mass and size. These insights will provide context for understanding the history of Earth and other planets in our own solar system, and inform the next generation planet hunters as they search for life beyond the solar system. A previous study had measured the masses of the two outer planets. This new study performed a more detailed analysis of the Kepler-138 system using additional Kepler data. This enabled the measurement of the mass of the Mars-size inner planet and improved the accuracy of the size and mass measurements for the outer planets. The results will appear in this Thursday’s issue of the journal Nature. Ames Research Center in Moffett Field, California, manages the Kepler and K2 missions for NASA’s Science Mission Directorate. NASA’s Jet Propulsion Laboratory in Pasadena, California, managed Kepler mission development. Ball Aerospace & Technologies Corp. of Boulder, Colorado operates the flight system with support from the Laboratory for Atmospheric and Space Physics at the University of Colorado in Boulder.